With their Army capped in size by treaty the WARTZ expanded their Navy, specifically their Marine forces.. Nowadays they have thousands of "naval personnel" who have never been on board a ship. (3) WARTZ Marine Corps Naval Infantry. They may have the naval uniforms, but none of them have any naval training or experience of life at sea. 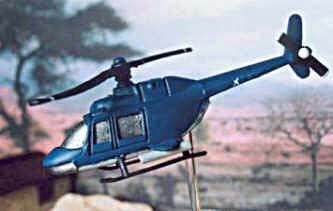 ( 4) A WARTZ Marine Corps helicopter on the attack. (5) WARTZ Marine Corps forces are equipped with American M48 tanks. 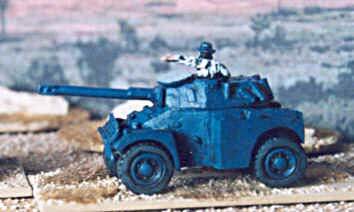 (6) Armoured car squadrons are in the forefront of any WARTZ attack. Credits: Unless otherwise noted all models are from Peter Pig's Range 17 "AK47 Republic"and were painted by Jack Glanville of Pioneer Professional Painting, aka Heviosso, CinC of the Ztumsi Independent Tribal Spiritualists and Prophet of Agassou. (2) P crew (17-21) with recoilless rifle(17-20) and .50 cal MGs on tripod (17-74)..
(4) A converted toy helicopter. (5) An M48 (1-34) from Peter Pig's Vietnam range. (6) Pack 17- 32 90mm Panhard AC (17-32) crewed by converted M leaders (17-22 with Australian heads (6-26) . (7) Unimog truck (17-15) with recoilless rifles (17-20) and P crew (17-21).